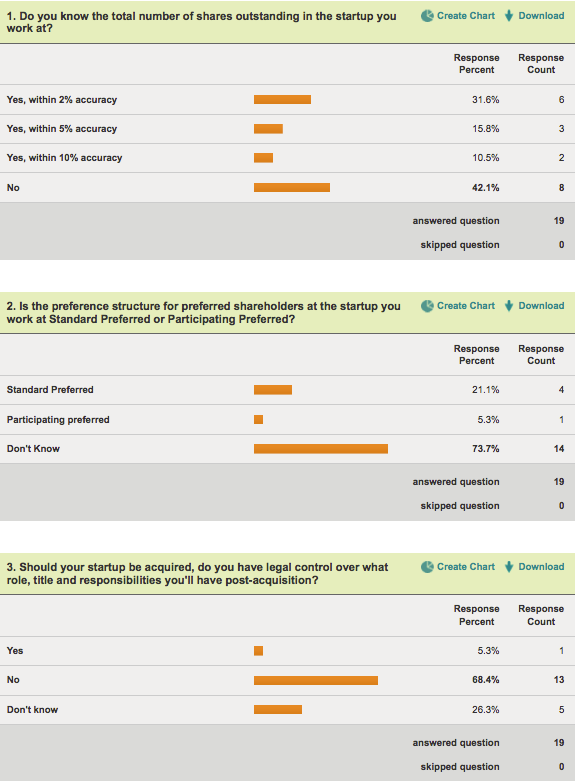 -73.7% don't know what preference structure their startup has. That's like not knowing what your insurance deductible is. 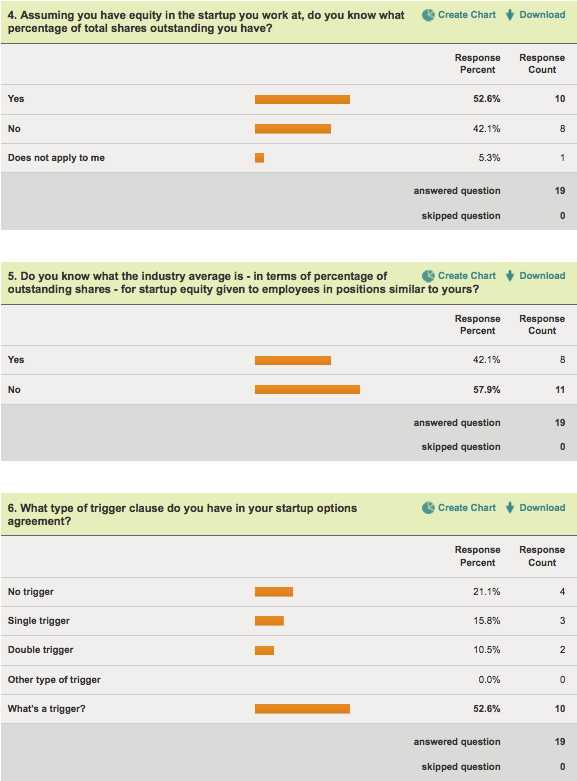 -58% of startup employees don't know how their % equity compares to others in similar roles. Given that the same group expects to make $100K-$1M on equity while working at their startup, you'd think know the comps would be important in negotiating, right? -Over half don't know what a trigger is, and only one quarter have one. People - you may as well get down on your hands & knees and pray before signing your offer letter, 'cause that's how much control you'll have over the outcome if you don't understand triggers. 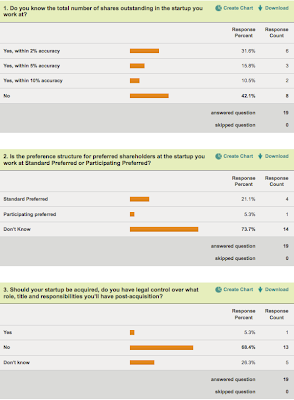 If your an entry to mid-level hire, how much control do you really have over these clauses? Is there any room to negotiate? Maybe people don't care to know because they are powerless to do anything about it? If you did know it would certainly help you make a career decision come a trigger event. 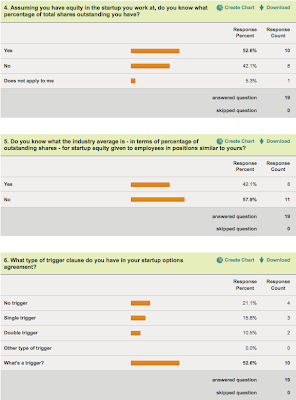 B Stein - 70% of respondents to my survey said they expect the value of their startup equity (after 4 years working there) to be $100K+, which implies strongly that even entry & mid-level hires expect equity to be a big portion of their total earnings. That said, entry/mid-level hires *need* to exert control over these areas or they're gonna get taken to the cleaners. From my experience, management's willingness to negotiate increases directly in proportion to the prospective employee's knowledge & the reasonableness of their ask, and has little/no relation to the level of role they're contemplating. The simple truth is that startups need employees, use equity upside as a primary lure, and that applies to all hires. So your're saying as long as I have knowledge of the legalese I can negotiate without putting off the management? As someone who is looking to join an early-stage company where I might be offered equity what should I be asking for in my contract? Accelerator clause - I will fully vest my equity during a trigger event even though enough time for my equity to vest hasn't come yet. That is something I would definitely want. Can you clue me in on other reasonable requests? How is the negotiation done? Do I need a lawyer on call when signing? I wouldn't want to unduly delay my hiring because I'm holding out on equity clauses. I think people don't negotiate because of a lack of knowledge and for some - fear. However, it is something I've thought about and wouldn't not want to be taken to the cleaners. You can know all of this stuff and it can all change as an acquisition approaches. How Silicon Valley Acquisitions Really Work. It's probably also important to understand the groups that control the common stock since that control is usually required to hold on to one or two board seats. @B Stein: drop me an email at chris dot zaharias at gmail dot com and perhaps we can talk today about your situation - I'd be happy to help!